The following account is heavily indebted to the excellent Regional History of the Railways of Great Britain published in the 1960s, particularly Volume 2: Southern England and Volume 3: London, both by HP White. Also to the documentary 'Terminus' about a day in the life of Waterloo station, directed by John Schlesinger in 1961. It is 1960 and you are setting off from London by train to have a walk in the countryside. The city you are starting from is very different from the one you see today. It is still one of the largest cities in the world, having not been outstripped yet by the megacities of Asia, Africa and South America and "has the greatest concentration of industry in this highly industrialised country", with a third of its workforce employed in manufacturing. There is a notable concentration of engineering and electrical industries, chemicals, clothing, furniture and printing - in fact "almost every conceivable kind of industrial activity is represented". The East End is full of garment manufacturers, as well as furniture, engineering and metal goods. The docks are still busy with shipping, right up to and including the Pool of London (the section between Tower Bridge and London Bridge), which is lined with wharves, cranes and ships. London is still the biggest port in the UK and the whole of the Thames eastwards from Tower Bridge is heavily industrialised. In the port areas there are industries working with raw materials - flour milling, sugar refining, paint manufacture and so on. Further downriver are engineering works, chemical plants, and the major proportion of the country's cement and paper production. All along the river are power stations (the coal for them is brought in by sea) including Bankside (later the Tate Modern) and Battersea Power Station. The river is busy with boats the whole way to its mouth. One of the consequences of all this industrial activity is that the air is also rather dirty, though things have improved since the Clean Air Act in 1956, which banned the use of coal for domestic heating in some parts of the city in response to the Great Smog of 1952. But the legacy of 100 years or more of coal burning is evident on all the buildings around you. St Paul's Cathedral, Westminster Abbey and the British Museum are all black with soot. When they are finally cleaned in the late 1980s and early 1990s Londoners will think there is something unnatural about seeing them looking so white and new. You will also find that many areas that later became gentrified are still solidly working class. This is true of a whole band of inner city districts - Fulham, Hammersmith, Islington, Camden, Holloway, Notting Hill, Battersea and Clapham. HP White says with some wonder that in 1833 "Greenwich was not only important for riverside activities [ie docks and industry] but as a fashionable residential area." The idea of Greenwich as a fashionable residential area is obviously a strange one for him. Oddly enough these inner city areas, and London as a whole, are suffering from population decline. People are worried that the city is hollowing out. Apart from perennially posh areas like Mayfair or Knightsbridge, better off people prefer to live in leafy suburbs. It will be nice to escape from all this grime and take a train to the country. Fortunately due to a vigorous programme of electrification between the wars, London's southern railway termini are relatively free of the steam and smoke that besets other stations. You still see some steam trains, however. Electrification has recently resumed after the war, so trains from Victoria to Margate and Dover are no longer steam-operated, as they were till just last year, but trains to East Grinstead still are, as are trains from Charing Cross to Dover and Hastings via Sevenoaks and Tonbridge, and from Waterloo to Basingstoke, Bournemouth and beyond (you can still catch the Atlantic Coast Express in summer all the way to Padstow, via Exeter, Plymouth and the North Cornwall line). Local trains out of Brighton are also steam-hauled. Surprisingly large numbers of boat trains still steam into Waterloo from ocean-going liners docking at Southampton. The port is still in its heyday as a passenger port and has recently opened a smart new ocean terminal. Passengers from New York and South Africa and all corners of the globe disembark from their ships and travel up to Waterloo on special charter trains. Of course such travel is only for the wealthy, migrants or those making big trips to see relatives. Better off people may also go on holiday to the continent by boat trains to Dover or Folkestone, which operate out of Victoria and use the line from Tonbridge to Ashford. There are up to 30 boat trains a day on this route in the summer, which is why stations like Headcorn have extra tracks running down their centre. You can connect at Calais or Ostend to long distance sleeper trains that go all over Europe. But "the majority of Britons have of course always taken their holidays at home", cheap flights and package holidays still being a thing of the future. London still has terminus stations that will later be demolished such as Broad Street and Holborn Viaduct. Waterloo is substantially as it is now (minus the former Eurostar terminal at its northern end: there are normal platforms there instead). Charing Cross has its 1906 ridge and furrow roof rather than the office block built on top of it in the 1980s. Victoria lacks the shopping centre built at the same time above the Brighton platforms, and has a cinema on its concourse playing continuous cartoons (a former newsreel cinema). London Bridge is unrecognisable, a confusing station in three different parts, each still with its Victorian canopy and still showing signs of war damage: it will be redeveloped in the early 1970s and again in the 2010s. (Incidentally London as a whole is also still showing signs of war damage: you can still find uncleared bombsites and one or two will last into the 1980s). On the station you will find some things familiar and some not. You can get a cup of tea or coffee, but the latter will be instant coffee and the former will be brewed in a large metal pot or urn to which further water and tea bags are constantly added, giving the resulting brew the taste and consistency of sump oil. Both drinks will be served in a ceramic cup that you have to drink from on the spot, not a disposable one for you to take away. The same will be true of any food you buy - no cellophane wrapped sandwiches: you will be served one on a china plate in the buffet. No ethnic food of any kind either, and no vegetarian, vegan or gluten-free. If you want a takeaway (a word that does not yet exist) step outside the station and find a fish and chip shop (you won't have to go far): don't be surprised when your food is served wrapped in yesterday's newspaper. Once on the train your chance of finding a refreshment car is quite good, at least on main line trains: not a "shop" selling snacks, but a proper buffet cooking fresh bacon sandwiches and even meals. As on the station, you consume what you buy in the buffet car: there are no disposable cups to take back to your seat. There are no trolleys coming through the train either, but if you are lucky one of the buffet staff may come past with a pot of coffee. There are no ticket machines (apart from very basic ones on busy Underground stations), so you will have to queue at the ticket window. At Waterloo be sure to pick the right one, as main line and local tickets are sold from two different ticket offices. Victoria also has separate ticket offices (and buffets) for the Brighton and Kent sides of the station. Wherever you are, there is no single queuing system, so choose carefully which of the several ticket windows to queue at: don't get stuck behind a passenger whose transaction will take a long time. On the bright side, no one will be paying by card: it is strictly cash only (pre-decimal currency, so shillings and half crowns, sixpences and threepenny bits). Fares are refreshingly cheap, which is just as well as Network Card discounts won't come in until 1986. If you want train information and your departure is not imminent, look for the printed timetables on the wall. If there is a printed pocket timetable for the route you plan to travel on, you would be advised to pick one up so you have information for the return journey. There is a telephone train information service and it even has automatic queuing system if all the operators are busy, but each terminus has its own number and can only give you information on its own particular services. If you are stuck, there will be a enquiry office at all medium to large-sized stations - an enormous one at major termini like Waterloo - whose employees will probably be able to recite the entire British Railways timetable by heart. To find your platform, consult the big mechanically-operated departure board, or listen for the loudspeaker announcements. There will be one of these for every train and they will come not from a disembodied automatic voice but from a real live person - at Waterloo a lady who sits in a glass booth high above the concourse. Understanding these announcements as they reverberate around the station is an acquired skill. At Waterloo the loudspeakers are also sometimes used to play jaunty military music. No one knows what the purpose of this is, but it may be to make the passengers walk faster across the concourse. Once you get to the platform, there is no electronic display telling you where the train is going, but there will probably be a printed or handwritten board. And plenty of staff to ask. Even so at medium-sized junction stations, where several trains in sequence call at the same platform, you have to be careful not to get on the wrong train. Once you are underway there are quite often no announcements at all: you need to keep an eye out of the window to know where you are and to make sure you don't miss your stop. Nobody reminds you to take all your personal possessions with you when leaving the train. One thing you will not see at the big terminus stations are high street shops. Maybe a bookstall and newsagent, perhaps a flower stall and almost certainly a kiosk selling chocolate, but no clothing outlets or supermarkets. The idea that a station concourse should be a shopping centre will not gain ground until the mid 1980s. Instead you will see facilities dedicated to various railway activities - parcels offices, lost property offices, a left luggage facility, maybe even a place where you can send on luggage ahead. There will be waiting rooms, and the refreshment facilities will be much larger than in later times - proper cafes and bars with counters and seating. At Waterloo and Victoria there is also a cinema. At Waterloo it is opposite platform 1, while Victoria's rather grand art deco establishment is by platform 19. These were built in the 1930s as newsreel cinemas, but to the delight of young children now show an hour long programme of cartoons which you can enter or leave whenever you like - you can even stay and watch the whole hour twice. Meeting friends is usually done under the clock. If your bags are too heavy (not a problem for you, obviously) there are plenty of porters happy to help you for a fee. If you need to call someone, there will always be a payphone - rows of them at the main London stations - though you may have the unfamiliar experience of having to queue to use one. Hearing what the person at the other end of a cracking line is saying is not easy with the din of a railway station going on all around you. The phones only take large pre-decimal pennies and you will need four of them for a local call, a lot more if you want to talk for any length of time or phone long distance. You have to push the pennies quite forcefully to get them to go into the coin slots and they not infrequently get stuck, meaning you then have to queue for another payphone. Setting off for your walk you have a bigger choice of destinations than today. Alas, you are just too late to take a train on the lovely Wealden line that ran from Horsted Keynes southwards to Lewes: it closed two years ago in 1958 (though it is said that a volunteer group has bought the line and hopes to reopen it), but you can still travel on all its neighbouring lines - the line from East Grinstead to Haywards Heath via Ardingly, the line from Three Bridges to Tunbridge Wells West, the "Cuckoo Line" from Tunbridge Wells West down to Eastbourne, and the line from Uckfield to Lewes. The Kent & East Sussex line from Robertsbridge to Headcorn via Tenterden has gone, as have the lines from Midhurst to Petersfield and Midhurst to Chichester, but you can still get a train to Midhurst via Pulborough, and from Horsham to Guildford or Shoreham-by-Sea. Trains run between Alton and Winchester serving pretty Itchen Abbas too, and you are just in time to travel on the branch from Paddock Wood to Hawkhurst. All of these lines are still operated by steam trains. You might want to hurry to use them, because they are all doomed to closure, the Hawkhurst branch as early as next year. 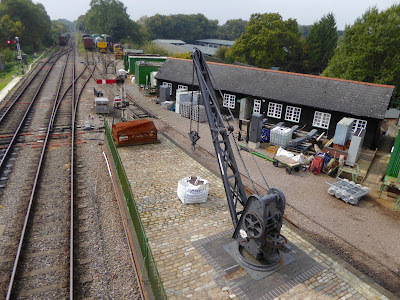 Also due to close next year is the branch line to Westerham, but once you get there you will find it pleasantly quiet, as the M25 has not yet been built yet (parts of it come in the 1970s, but it is not completed until 1986). That means that there are lots of lovely walks that are not yet blighted by traffic noise, particularly around Oxted, Reigate and Redhill and other parts of the North Downs. Travelling to your destination by train you might be surprised at how different some things are. Firstly the towns you pass through have surprising amounts of manufacturing industry. Who would have thought that Ashford would produce motorcycles, Guildford fire engines, Weybridge airliners, Brighton bus bodies, Basingstoke lorries and Dover fountain pens? In Kent there are still coal mines. You will be surprised to see freight facilities attached to every station, though road haulage is eating away at their business and in ten years they will all have closed. But for now, you can still see steam-hauled "mixed goods" trains, stopping at each station and picking up a wide variety of cargoes in a colourful assortment of wagons. On the North Kent line from Chatham to Margate there may be as many as 40 freight trains a day, more in fact than the passenger trains. Even at small rural stops there will probably be a siding or two, a brick shed and a loading dock for cattle and horses - often occupying an area that will in later times be the station car park. Livestock, poultry, milk, vegetables, salad crops and fruit are still sent to market by rail, loaded by hand into wagons, while coal, agricultural machinery, newspapers and all sorts of products come the other way. Town stations have big freight yards. In Tonbridge, where industries include printing, tar distilling, cricket bats, water filters and sheepskins, the station is nevertheless the biggest employer, with 150 staff. Many of them work in its large freight area. In Lewes the freight facility occupies the original 1846 passenger station right in the heart of the town (passenger services having been moved to the current station in 1857). Dover is still a big port for cargoes such as timber, pit-props, wood pulp, balls and cement, and "much of this traffic is distributed by rail". In cities there are vast freight complexes. Every main line terminus has one, and some of them are very extensive - the enormous area north of Kings Cross being one example. As in Lewes, some London freight facilities are old stations from the early days of the railways that started out as passenger terminals and then were turned over to freight when a new station was built. Thus the original 1838 Paddington station, the impressive Nine Elms station of the same year (superseded by Waterloo) and the remains of the 1840 Bishopsgate station (precursor to Liverpool Street) can still be seen. None of these are destined to survive much longer. If you are waiting for a Metropolitan Line train at Farringdon you may be surprised to see a freight train chugging through on the adjacent line, heading for the Snow Hill Tunnel and Blackfriars Bridge. As many as 90 freight trains a day still use this route, but by 1971 they will have disappeared and the bridge they used will be partly demolished, leaving its red pillars sticking up enigmatically out of the river. Mail also goes by rail and at even medium-sized stations there will be a parcels office from where you can send consignments all over the country. All but very short distance trains have a guard's van (in the middle on more modern electric units) in which small cargo of this kind is carried. On station platforms there will be trolleys loaded with boxes and mail bags waiting to be dispatched, and at larger stations long lines of these trolleys are towed across the concourses, posing a hazard to passengers as they sweep around corners. Some London termini - for example Waterloo and Paddington - have a broad central platform for handling such traffic. Accessible to vehicles, these sometimes double as taxi ranks. Parcel and mail activities become particularly busy late at night and in London newspaper vans race through city streets to get the latest edition onto "milk trains" - special parcel and mail trains that run in the early hours. Passengers can also use these trains if they are late back from a night on the town, but they are very slow, making long stops at each station for loading and unloading. The countryside is very different in places. The line from Swanley to Faversham (on the way from Victoria to Margate) "is bordered throughout by intensively cultivated fruit and vegetable farms with scarcely a grass field the whole way". Paddock Wood "is the centre of a most intensively farmed district with thousands of acres of orchards and hop gardens." Down on Romney Marsh asparagus is a big crop. All of this market gardening and hop-growing means some of our familiar walks look a lot less attractive. If you are used to seeing an oast house converted into a pleasant rural dwelling, with grassy pastures all around grazed by sheep, imagine it instead as a working agricultural farm building surrounded by row upon row of hops. Arriving at your destination, be sure to have your ticket handy as it will probably be checked. Even small rural stations are still staffed - when they are not dealing with passengers, the clerks spend a lot of time booking in and handling the freight. Line gangs (dressed in ordinary clothes - hard hats and orange jackets are a long way in the future) still maintain a local section of track, sheltering in trackside concrete huts when not working. There is also quite likely to be a staffed signal box. These railway workers almost certainly gather between shifts in the Railway Inn just down the road from the station. Passengers may wait for trains there too. Even quite modest stations may have a buffet, and ones at junctions certainly will. In general rural stations have more buildings than you see today, the mania for stripping stations of their facilities having not yet broken out. A ticket office will probably be open and there is likely to be a waiting room of some kind, heated in winter. Vandalism and cost cuts will later see all of this boarded up, leaving stations bleak and empty. But on the other hand many stations look rather tatty and run-down in 1960, suffering from two decades of under-investment. Revamping stations will not really begin until the 1980s. You are now ready to enjoy your walk. Let's hope the weather stays nice for you (one thing that has probably not changed much is the gap between the weather forecast and the actual weather). You will be wearing old clothes and sensible shoes - maybe boots, but certainly not high-tech walking kit: people don't yet walk around the countryside looking as if they are about to climb Annapurna. To keep the rain off you will probably have a macintosh: "cagoules", garments resembling modern walking waterproofs but without their breathability (so they keep in as much moisture as they keep out) will not appear in shops for a few years yet. Your rucksack will be a pear-shaped design that hangs rather awkwardly on your shoulders. Since trekking poles do not yet exist, you will need to bring a wooden walking stick or pick up a stout branch. There will be a lot more stiles and a lot fewer kissing gates than today. I hope you brought sandwiches because unless it is a large inn in a major town your pub is unlikely to have very much in the way of a food offering - perhaps a pork pie or cheese sandwich if you are lucky. If you can't find a tea room, don't look to pubs for a hot drink either. Pubs are for drinking alcohol and they will be surprised if you ask for anything else. But on the other hand there are a lot more of them in both towns and villages than you find today. Most will be divided into a basic "public bar" and a more comfortable "saloon". Women will get stared at if they go in the former, and even in the latter may attract unwelcome advances if they are not accompanied by a man. Children are definitely not allowed, but no one will look askance at you if you leave them to play outside unsupervised. If you pass through a town, you may find it has many more shops than you are used to - or more useful, practical shops at least. Out of town shopping and the internet has not yet robbed rural towns of their vitality, and even villages probably will have a bakery, grocer, post office or general store. If you can't get to a station at the end of your walk, you will find a pretty good network of bus services. There may even be a Green Line bus that can take you all the way back to London. On your walk be sure to listen out for birdsong and to keep your eyes peeled for butterflies and wildflowers. The introduction of modern farming methods in the decade ahead will lead to catastrophic declines in many species. Numbers of some bird and butterfly species will dip as much as 90 percent, cornfield flowers will disappear and meadows will be eradicated. But you can still experience them at their full extent, hear a spring in which a dozen cuckoos are singing at once, see woods full of pearl-bordered fritillary and white admiral butterflies. How I wish I could be there with you.